This article introduces inverter principle and its commissioning at site, analyses energy saving effect and gives reference to understand inverter operation. Power plant capacity is 4×300MW. Design rating of 7# is 300MW. Furnace is equipped with two axial flow ID fans AN31e6 (u19-10). Rated flow is 321.4m3/h. Total pressure is 5452Pa. Shaft power is 2104kW. Motor model is YKK800-8-W. Rated power is 2500kW. Rated voltage is 6kV. Rated current is 293A. Power factor is 0.86. Rated speed is 746r/min. Flow is adjusted by changing angel of fixed blade. According to requirement of power grid, power generation load usually adjusts in 50%～100% of rated load. With output power of generator changing, relevant equipments of furnace system also adjust with load changing. Air output and air input of furnace change. ID fan is adjusted by changing angle of blade. Despite this adjustment mode has energy saving effect compared with damper control, there is still much throttle loss. Especially during operation of low load, much output power of motor wastes on damper. Secondary, fixed blade adjustment action is slow, causing lag of load adjustment response. During starting, start current is 5~8 times of rated current. Big start current brings big impact on motor and cable, affecting stability of power system. In the meantime, strong impact torque and current shorten lifetime of motor and other equipment. Lots of practices prove that changing motor speed by inverter can solve above problems and meet technics requirement of different loads. Electrical system is 'one drives one' mode (dashed line parts is the added). Medium voltage inverter can switch operation mode according to need. For example: mode of one runs in variable frequency and the other runs in direct on line, and mode of the both run in direct on line. The disadvantage is that during switching, load needs to be adjusted. After lowering load, stop 1# (or 2#) ID fan, then switch the operation mode. In normal state, two ID fans run in variable frequency. Medium voltage inverter has local control and remote control. In remote control, speed signal from DCS trails inverter speed and makes feedback. In local control, remote control is invalid. There is auto and manual modes when inverter is controlled by DCS. In manual state, personnel controls inverter speed by changing in interface to realize negative pressure adjustment. Precondition of inverter start-up is that medium voltage switch of motor must close, that is, start feedback is 1. Original conditions of fan start preserve as allowable conditions of inverter start. Ready signal from inverter is another start condition. During inverter commissioning (regardless in local control or remote control), we find minimum frequency can not set less than 15Hz, otherwise it causes overcurrent of power cell of inverter. Inverter trips off. So when motor starts, minimum frequency of inverter can not be set less than 15Hz. 1) Start feedback of medium voltage is 1. 2) Ready from PLC of inverter is 1. 3) Output of given speed of inverter is not less than 30%. After inverter of single side fan trip off, FD fan of the side should link stop. Medium voltage switches link stop after 1# and 2# inverters, so preserve original circuit of cascading trip unchangeable. Safe operation of furnace is fundamental guarantee of plant power. Despite inverter is reliable, once there is problem during operation, safe operation of furnace must be guaranteed. So switch of "line frequency---variable frequency" is needed. Once one inverter of fan is broken and can not recover in short time, system turns to blade adjustment automatically. 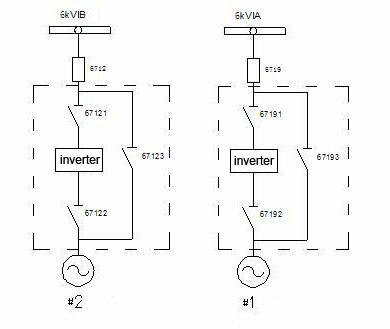 In this case, stop one variable frequency system and the other ID fan system runs in variable frequency. At the moment, furnace load should keep at about 180MW. Following data is comparison data of 1#, 2# ID fan with inverter. From above table, in the case of same load, daily consumption of two ID fans is 40761 kW•h in direct on line and 22869kW•h in variable frequency. Power saved is 17892kW•h, power saving rate is 43.8%. Adopting medium voltage variable frequency technology reforms equipment of high power consumption, which not only reduces power consumption and coal consumption, but also plays active part on equipment safety and reliable operation.